A rambunctious group of five college friends steal away for a weekend of debauchery in an isolated country cabin, only to be attacked by horrific supernatural creatures in a night of endless terror and bloodshed. Before May of 2012, Joss Whedon seemed destined to be known solely as the guy who ran the Buffy the Vampire Slayer TV show. Sure, he had cult hits like the excellent series Firely, but he never reached much of an audience with any of these other properties. Then Whedon directed The Avengers and changed all of that. With a gross of $621 million, it ended up as the third highest-grossing movie ever in the US and seemed likely to radically change notions about Whedon’s ability to create something with mass appeal. Avengers wasn’t Whedon’s only 2012 release, though, as he co-wrote April’s The Cabin in the Woods. With a budget of only $30 million, Cabin offered a much more modest affair than the $220 million Avengers, and its grosses reflected this: it took in a mediocre $42 million. However, it earned good reviews and piqued my curiosity, so I thought I’d give the Blu-ray a look. Five college students – Dana (Kristen Connolly), Curt (Chris Hemsworth), Jules (Anna Hutchison), Marty (Fran Kranz) and Holden (Jesse Williams) – go to spend a weekend at a cabin in the middle of nowhere. Unbeknownst to them, this is no ordinary location. Instead, technicians at a mysterious corporation watch, analyze and often manipulate their behavior as events follow a horror movie path. Cabin becomes the second movie I’ve watched in recent days that possibly tells us too much too soon. When I viewed 1992’s The Hand That Rocks the Cradle, I felt it probably revealed the lead character’s true identity too early in the story, and I can’t help but think that Cabin might’ve worked better if it didn’t reveal the manipulative framework at the very start. Indeed, we meet those in charge of the program before we encounter the college kids, so we know something strange is on the horizon. Granted, we don’t know what the details will be, but we’re aware that the technicians are manipulating events. This isn’t a major flaw, but I do think the story would’ve worked better if it kept the behind the scenes machinations hidden for a while. I don’t want to offer specifics – the movie still has a lot of surprises – but there’s one point at which a character’s revelation would’ve allowed the tale to reveal the workers behind the curtain. I think that the story could’ve progressed as a standard horror flick until that point and then allowed us to learn about the truth. Despite that narrative gripe – and some enormous plot holes - I still like Cabin and think it provides a clever tale. 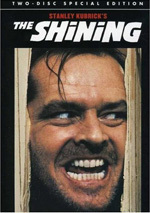 It shows influences such as the Hostel and Scream series but doesn’t come across as derivative. It manages to make a name for itself and create an interesting deconstruction of the genre. It also delivers a real humdinger of a third act. Again, I don’t want to give away any spoilers, but events go into “horror movie overdrive” in such a balls-to-the-wall manner that it makes me almost forget my minor problems with the first act. The last third takes us to some crazy places and provides a terrific ride. All of this is enough to ensure that Cabin winds up as a fun experience. While I can find some places to improve it, I don’t think those issues hamstring it in a notable way. This remains a lively and clever horror movie. Today’s Surprising Choice in Marketing: to my surprise, the packaging for Cabin never alludes to Avengers. It bills the film as being “from the creator of Buffy the Vampire Slayer” but males no reference to the much more successful – and much more recent – superhero hit. Perhaps Lionsgate did this to avoid angry letters from parents who expected the “R”-rated horror movie to offer family-friendly material – or maybe they figured Cabin would simply appeal more to a Buffy crowd. Nonetheless, it’s unusual to see a flick promoted with no mention of another effort that just became one of the biggest box office successes in history. The Cabin in the Woods appears in an aspect ratio of approximately 2.40:1 on this Blu-Ray Disc. Though much of the image looked solid, some inconsistencies occurred. Actually, the vast majority of the issues related to blacks and shadows. Dark elements tended to be inky and without great depth, and low-light shots were rather murky. The movie featured an awful lot of shadowy images, and they often made it really tough to discern the action. I suspect that this was a conscious choice. Cabin boasted a lot of computer effects, and with a relatively low budget, the filmmakers probably opted to make it difficult to see them so their flaws wouldn’t be noticeable. While I understand that decision, it still left us with a movie in which I found visual frustration, as the frequent moderate lack of visibility could annoy. Otherwise, the transfer looked fine. Other than a smidgen of softness in some interiors, sharpness provided solid definition and accuracy, and I noticed no shimmering, jaggies or edge haloes. Print flaws were absent, and colors worked fine within the film’s stylized palette. Though we didn’t get a broad spectrum of hues, the represented tones looked positive. The frequent issues with low-light shots and blacks were the most notable flaw on display, and they left the image with a “C+” grade. As for the DTS-HD MA 7.1 soundtrack of Cabin, it worked quite well. The soundfield offered a nice range of information. When action-oriented sequences occurred, these gave us a lot of material. For instance, various attacks used the various speakers in an involving way, and a few of the horror scenes also threw out good details around the spectrum. The surrounds added strong reinforcement and fleshed out the room well. Audio quality appeared positive. Speech was natural and concise, without edginess or other issues. Music was usually robust; I thought the band performance at the bar was a bit flat, but otherwise, score and songs seemed solid. Effects were also clean and dynamic. This was a very good track that served the film well. Cabin comes with a nice set of supplements. We launch with an audio commentary from writer/director Drew Goddard and writer/producer Joss Whedon. Both sit together during this running, screen-specific look at story/character subjects, cast and performances, sets and locations, cinematography, editing and pacing, effects and a few other areas. Most of the commentary looks at writing and the script. That gives us some good insights about the processes they went through to create the film, and they throw in a fair amount of other details as well. Add to that a nice sense of humor and this becomes a fun, lively chat. For a picture-in-picture feature, we head to “It’s Not What You Think: The Cabin in the Woods” Bonus View Mode. It provides footage from the set, audition clips, and comments from Goddard, Whedon, production designer Martin Whist, special effects supervisor Joel Whist, executive producer Jason Clark, editor Lisa Lassek, and actors Fran Kranz, Bradley Whitford, Kristen Connolly, Jesse Williams, and Chris Hemsworth. The interviews cover cast and performances, story/character issues, sets and locations, photography and effects, editing, and a few other subjects. When the picture-in-picture material appears, it gives us some nice glimpses of the production and insights about the shoot. Unfortunately, these moments appear much less frequently than I’d prefer, and the disc gives us no obvious way to skip the dead air. While I like the provided information, the sluggishness of the presentation causes frustrations. A few featurettes ensue. We Are Not Who We Are: Making The Cabin in the Woods runs 28 minutes, 33 seconds as it provides comments from Whedon, Goddard, Kranz, Lassek, Clark, Martin and Joel Whist, special makeup effects artist David Leroy Anderson, costume designer Shawna Trpcic, and actors Jodelle Ferland, Anna Hutchison, Bradley Whitford, Richard Jenkins, and Dan Payne. The program looks at the film’s origins and development, sets and locations, Goddard’s impact on the production, stunts, action and effects, cast and performances, makeup and costumes. Most of “We Are Not…” focuses on footage from the set. This means we get a lot of nice shots from the production, and the comments help flesh things out as well. “We Are Not…” doesn’t create a complete “making of” show, but it gives us plenty of interesting material. Under The Secret Secret Stash, we find two featurettes. These fill a total of 13 minute, seven seconds and deliver “Marty’s Stash” (8:04) and “Hi, My Name Is Joss and I’ll Be Your Guide” (5:02). “Marty” shows Kranz and gives us a tour of the character’s drug-related props, while “Name” takes us around the cabin set with Whedon. “Marty” is mildly interesting but too long; “Name” seems more fun, as it teaches us a lot about the movie’s main set. An Army of Nightmares: Make-up and Animatronic Effects goes for 12 minutes, 10 seconds and features notes from Goddard, Lassek, Whedon, David Leroy Anderson, special makeup effects artists Mike Fields and Heather L. Anderson and actor Maya Massar. Here we get a strong discussion of how the movie brought its many monsters/creatures to life. Some of the other pieces have touched on these areas, but “Army” brings out a lot more and works well. Next comes the 12-minute, seven-second Primal Terror: Visual Effects. It includes remarks from Goddard, Whedon, Clark, Martin Whist, David Leroy Anderson, visual effects supervisor Todd Shifflett, miniature designer Jack Edjourian, special effects designer John Stirber, and model shop supervisor Monty Shook. As expected, “Terror” acts as a compliment to “Army” and digs into the movie’s digital elements. Like its predecessor, it proves to be tight and informative. Finally, we find a Wondercon Q&A. It fills 27 minutes, 30 seconds and boasts a panel with Whedon and Goddard. They discuss the film’s origins, writing and development, story topics and the film’s tone, issues with studio/distribution, aspects of their collaboration, influences and inspirations, and a mix of other movie-related topics. After a commentary, a picture-in-picture component and a bunch of featurettes, inevitably some of the material becomes redundant. Nonetheless, we still learn a fair amount of new facts, and the chat moves along at a nice pace. The disc opens with ads for The Possession, The Last Exorcism, Cabin Fever and My Bloody Valentine. These show up under Also From Lionsgate too, and we get the trailer for Cabin as well. 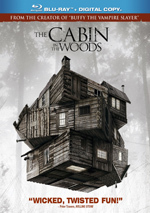 Although I have some minor gripes about the film’s framework, I think the many positives of The Cabin in the Woods far outweigh those complaints. Most of the movie proves to be clever and inventive. The Blu-ray comes with very good audio and supplements, but picture tends to be murky, probably due to cinematographic choices. Overall, I like this release and really enjoy the movie.